Julian Alaphilippe (Deceuninck-Quick-Step) edged the reduced bunch sprint on the Via Roma at Milano-Sanremo Saturday, pipping Oliver Naesen (AG2R-La Mondiale) and Michal Kwiatkowski (Team Sky) to the line. The win came after his team set the fireworks flaring on the Poggio to draw out an elite group including several pre-race favorites. As is typical of La Primavera, the action was distilled into the final 10 kilometers of the 291km, seven-hour epic. 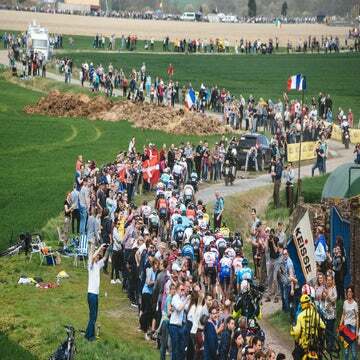 The race was all together as the peloton hit the Poggio, the short and often-decisive climb that has been the springboards for many attacks, including Vicenzo Nibali’s race-winning move in 2018. Deceuninck-Quick-Step took to the front and soon had the race lined out, with Zdenek Stybar and Philippe Gilbert setting a furious pace that put a number of the heavy sprinters in trouble, including Dylan Groenewegen (Jumbo-Visma), Nacer Bouhanni (Confidis), and notably, their own sprinter Elia Viviani. With the peloton on its limits, Alberto Bettiol (EF-Education First) launched the attack which caused the decisive selection. With the summit of the Poggio looming, the Italian jumped out of the front of the bunch, with Alaphilippe and Kwiatkowski following hot on his heels. The trio were soon joined by Peter Sagan (Bora-Hansgrohe), Alejandro Valverde (Movistar), Matteo Trentin (Mitchelton-Scott), Wout van Aert (Jumbo-Visma), and Naesen. Shortly after the lead group came off the descent of the Poggio, they were joined by Daniel Oss (Bora-Hansgrohe), Tom Dumoulin (Team Sunweb), Simon Clarke (EF-Education First) Vincenzo Nibali, and Matej Mohoric (both Bahrain-Merida). As the group raced towards the finishing straight on the Via Roma, Trentin, Naesen, and Mohoric all took turns to try their luck, with Van Aert and Alaphilippe chasing them down. The group all came into the Via Roma together and the cat-and-mouse began. Mohoric broke the deadlock and went first, with Alaphilippe shadowing him and taking the front with 150m to go. The Frenchman looked like he was losing his legs in the headwind, but was able to hold off Naesen and raise his hands in victory as he crossed the line for one of his most prestigious wins. Having narrowly lost out to Kwiatkowski and Sagan in the 2017 edition of Milano-Sanremo, Alaphilippe turned the tables to take his first monument win, and the most prestigious of the haul of 19 victories taken by his team in 2019.